I'm not fantastic at learning from my knitting mistakes. Well, not the mistake that goes ... "hmmm, I've got my doubts about this" ... much knitting later ... "yip, this isn't looking right" ... still more knitting (even the effort of ripping back to fix a boo boo or two) ... "I wonder if this will be ok" ... knit, knit, knit ... and so on. Knitting on with doubts in my mind until finally I get to the point where I wake up one morning, hours and hours of knitting later and declare; "That's it. This is not working. I'm frogging it". That was me yesterday morning and I've had this muttered conversation with myself over knitting soooo many times. When will I learn to listen, stop, properly assess and get real when I first have doubts? Because we all do it, right?! (I do hope you're nodding). Sometimes we all get a niggling doubt, push it down, ignore it for the longest time and then bam! It's too late. We've finished knitting what we've been worried about and it's totally wrong and we can't believe we didn't stop a long time ago. Thank goodness, this time I had my awakening before my cardigan was finished. Maybe it was because I've been on a cardigan marathon lately and I was feeling a bit braver about admitting this cardigan was not going to work? Maybe it was because I have a gazillion other projects that I want to get on with and I'm not feeling like wasting a single stitch? Maybe it's because I finally finished a sleeve, tried it on and, remembering how small the body seemed, the reality of how tight this cardigan was going to be hit me like a ton of bricks. Do I really want a sausage squeezing, body hugging, textured cardy in an electric purply-pink colour? No I do not. So, here it is. All ripped out. I didn't feel bad about frogging it. I was feeling more relieved than bad. I actually had a tinge of excitement that now I could start something else. I felt slightly nostalgic because I really love this pattern but was also comforted by the fact that I could get more yarn and make it again (some day). Overall, I felt positive as I pulled out all my stitches. My yarn is free for something else. My needles are free for something else. 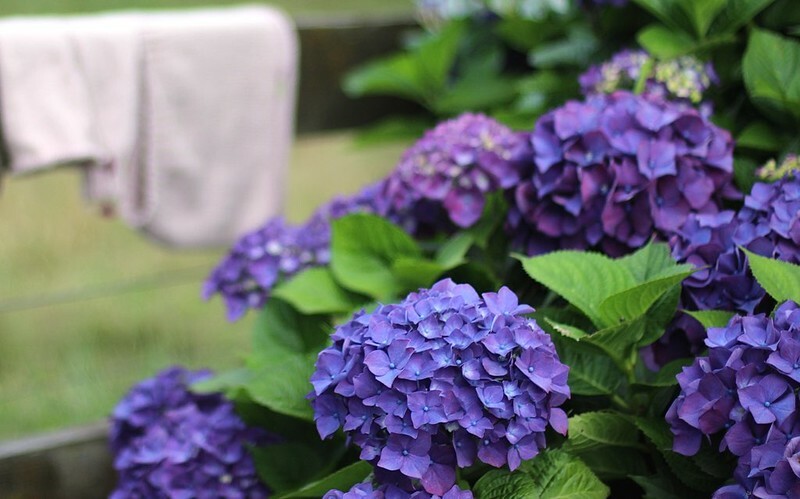 And, I'm free from that niggling feeling that my cardigan was doomed. So what went wrong? I really should try and learn something from this journey. I know. I know. Never do that! Especially not for an adult cardigan. Never. 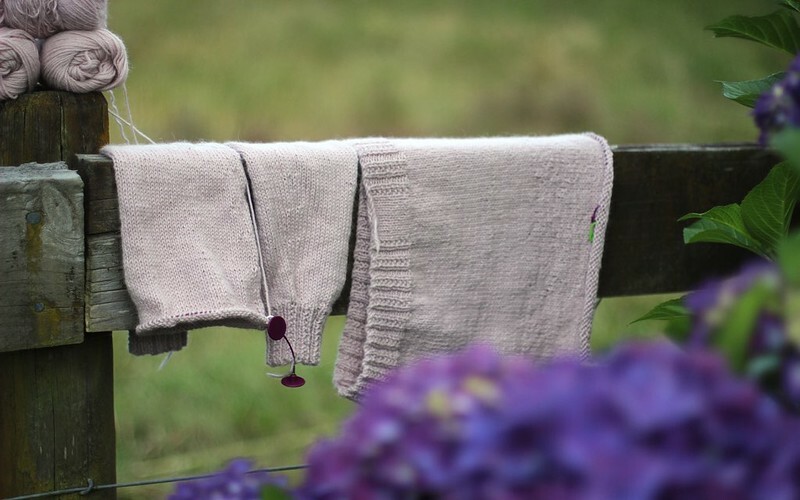 My lovely, clever and very wise friend Joanne actually had words with me about the mistake of not swatching when I sat at her kitchen table knitting on this thing right at the beginning but I didn't listen. I was stubborn, cavalier and crazy. You'll learn from my mistake won't you? You'll make sure to swatch from now on? Go on. I'm going to try really hard to learn my lesson too. It's not as if I don't like the cardigan that's on my needles. I really do. It's going to be fabulous and I can't wait to wear it. It's just that, I think that when I showed you all my wips last month in my first podcast and positively "whipped" through them, I started to feel, that if I simply put my mind to it, I could knock them off really quickly. It's a bit crazy to feel in a hurry about my knitting. Especially when it comes to a warm cardigan. I mean, knitting is supposed to be all relaxing and smooshy isn't it? And, it's not anywhere near cold here, It's summer! I'm unlikely to need this new cardigan until May. But I'm getting increasingly impatient to get it off my needles, I want it finished NOW and unfortunately that means I'm becoming less inclined to knit on it. So it gets slower. And I get frustrated. And so on. It's a bit of a vicious circle. Don't get me wrong. I am knitting on it. But I'm a bit scattered when I do so. 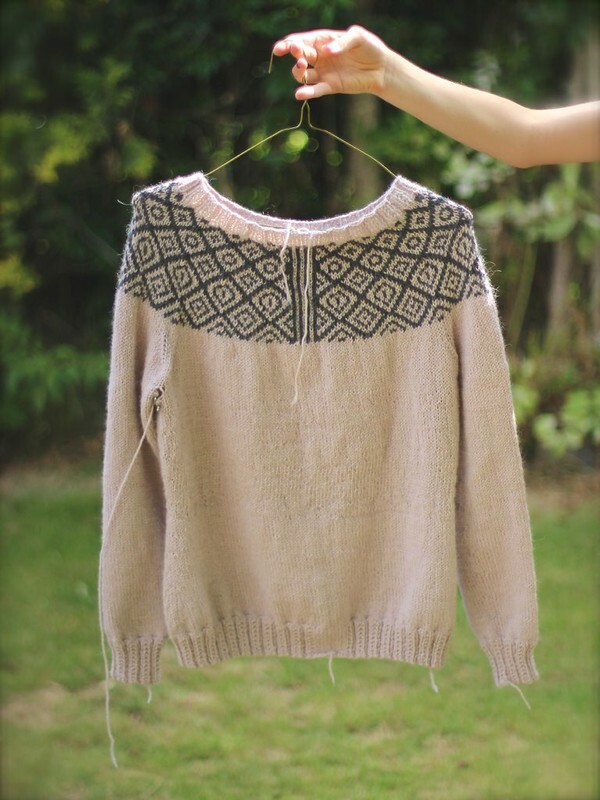 I pick it up, knit a row or two, put it down, check instagram, pick it up, decide I need to take another photo of it to post on instagram or facebook, put it down, fiddle about with that, finally pick it up again. Sigh at how slow it's going. Put it down. Make a cup of tea ... You get the picture?. Rather absurdly, despite my dithering, I am actually making progress and I haven't really got too much to do. I can see that when I hang it up and see the gaps. I guess it makes me feel a little bit better. I've finished the body and am almost up to the shoulder cap for one sleeve and the elbow on the other. I don't know. It'll be great to get it done. I was really hoping to show it to you all finished in my next podcast due out next week but I don't think that's going to happen. Not unless I put everything else on hold and just knit, knit, knit. Oh so tempting! but oh so unlikely. Please tell me what do you do to get enthusiastic about your knitting when it starts to go really super slowly?! Help?! 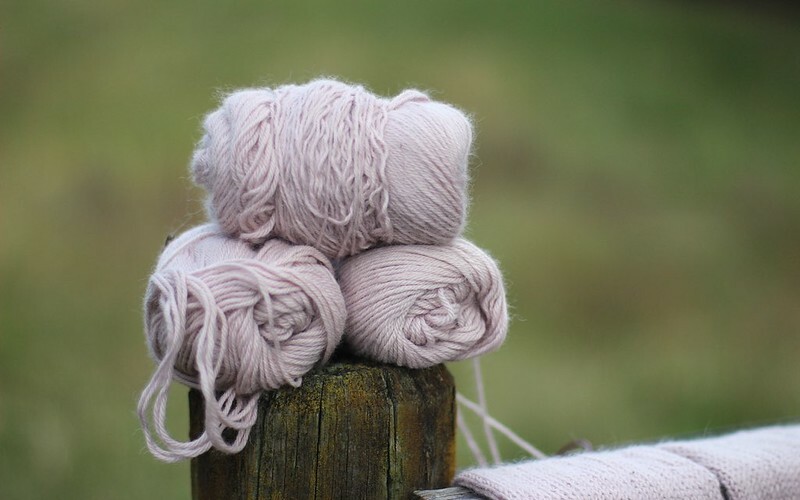 Are you a monogamous knitter or a polygamous knitter? A monogamous knitter works on just one project at a time and finishes it before they cast on the next. 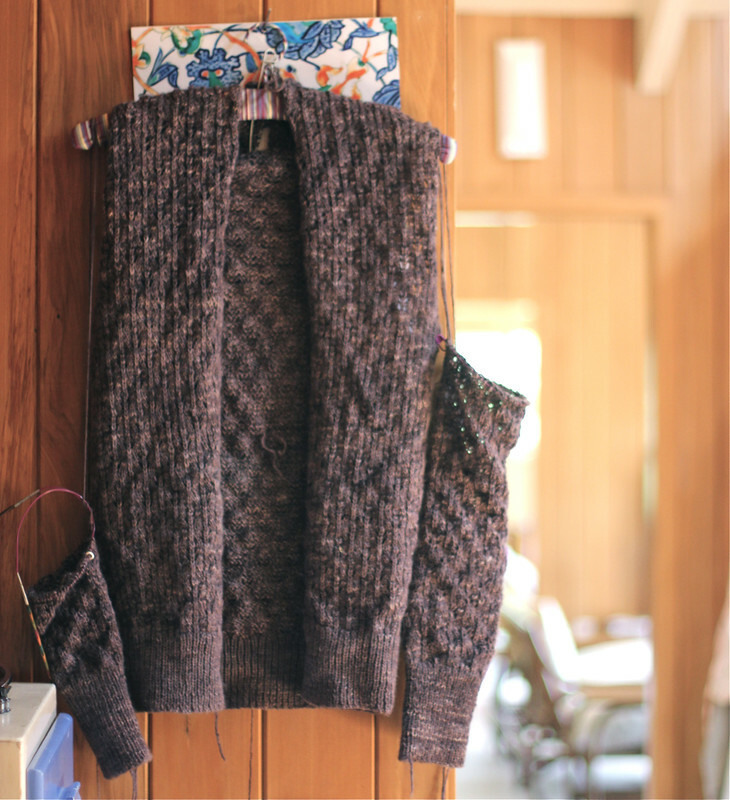 A polygamous knitter has numerous projects on the go, darting from this one to that, usually simultaneously gathering numerous lovely project bags in which to store all their WIP's (works in progress). Some knitters fall into polygamy after being struck by the "casting on all the things" bug but others very deliberately arrange themselves so that they have just the right project for every situation; handbag knitting that gets taken everywhere, something complicated for when they fancy a challenge and a project that's perfect when relaxing on the sofa in front of a good movie and so on. I've been both. 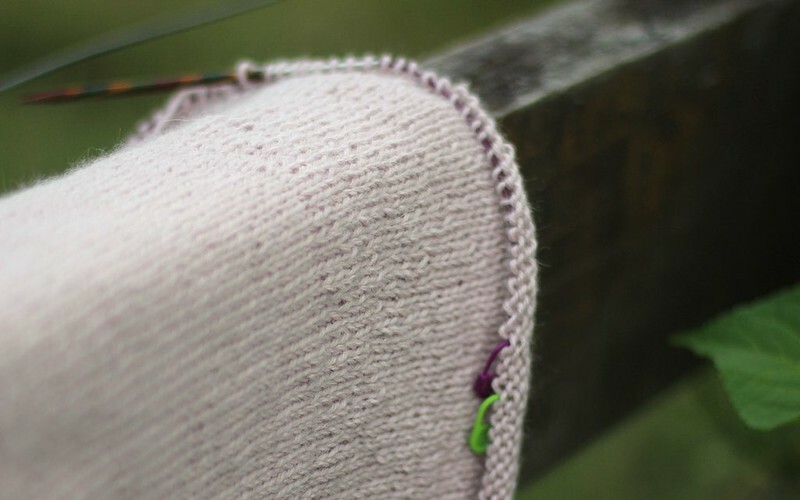 When I first started knitting with passion and fury I had just one project on the needles at any one time. In fact, I knitted this way for years. Cast on, knitted and cast off. I knew what I wanted to knit next, had yarn and patterns lined up ready to go but I didn't start something new before I'd finished what was on the needles. If something wasn't working I didn't hide it away, I'd rip it out and either start it again or begin something new. Thinking back I wonder if my disciplined approach to knitting was because I had very small babies and children taking up lots of my time and I was mostly knitting for them, so was eager to get things finished and on them. But actually, I don't think it even occurred to me to work on multiple things. I mean, who did that? Well, I later discovered that lots of people do just that and before I knew it, so did I. I'm pretty sure I can date my transformation back to my life-changing visit to Knit Nation in London in 2010. That and discovering Ravelry, which happened all about the same time. It seemed that everyone was knitting all the things, all the time. 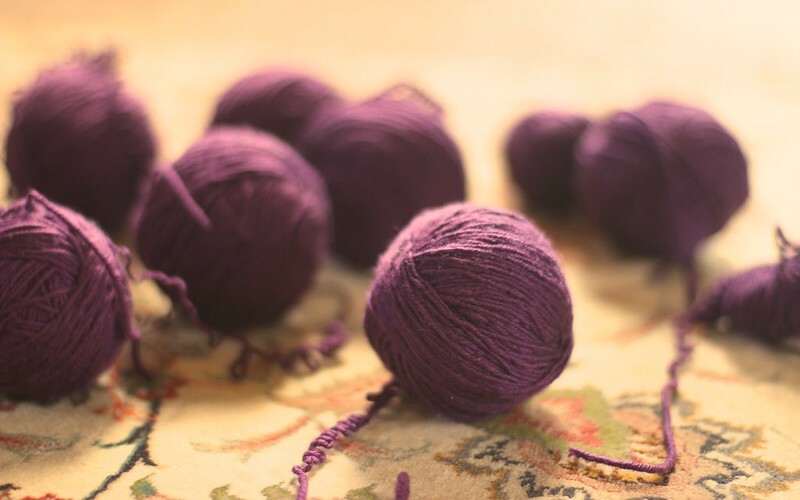 And, without even being aware of it, from that day forward, I drifted from being a monogamous knitter to a polygamous knitter and project bags, needles and balls of yarn started to make their way into all the corners of our house. I've decided that 2015 is going to be different and I've started as I mean to go on. 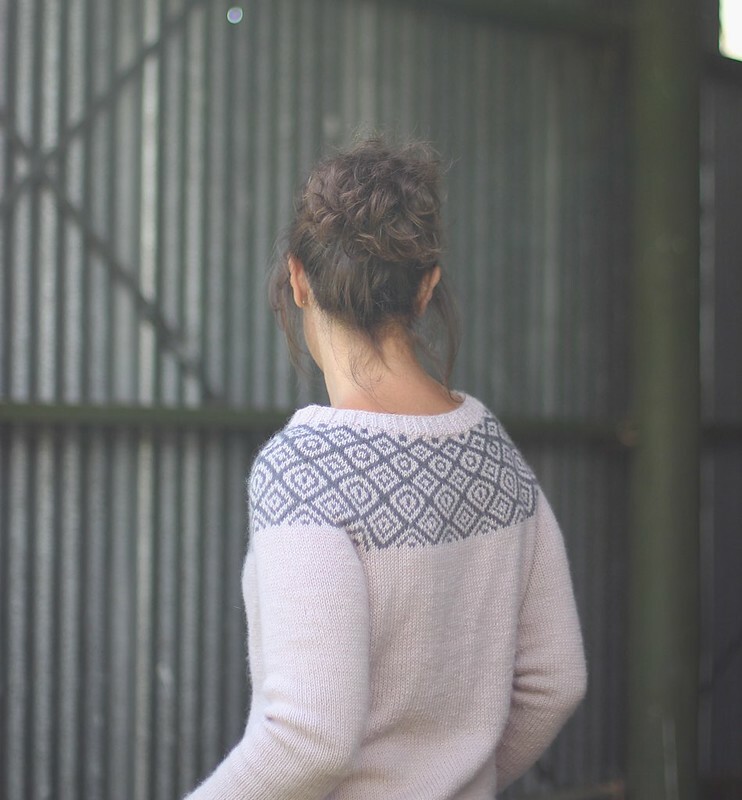 This year I'm going to finish things because I LOVE getting things finished and I LOVE wearing my hand-knits. I'm going to start with all the WIP's I've got lying around and then after that, only work on just a few things at any one time and one of those will be a new design. 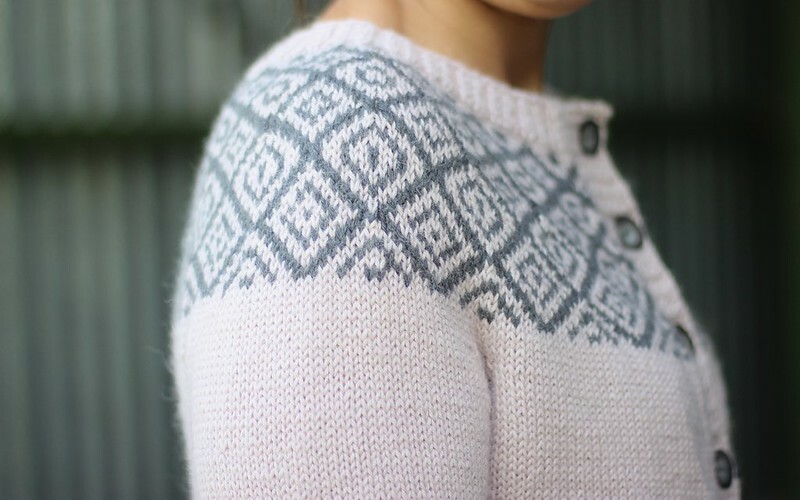 I'm starting with my gorgeous Epistrophy cardigan. Knitting (nearly) exclusively on that these last few weeks has reminded me how satisfying it is to keep things simple especially when it comes to knitting. It's nearly all finished, just steeking (slicing it in half! ), the button bands and grafting under the arms to go! If you want to see me go at it with the scissors - head over to instagram tomorrow ... If all goes to plan, I'm going to make the cut! Eeeeek! Just before Christmas I resolved to cast on a new cardigan. I had the pattern, the wool, just not a terrific amount of time and rather a few bits on the needles already. "Never mind" I thought, "this'll be a super quick knit that flies off the needles". In my head I imagined that it'd be finished by new year's eve. Yeah, right. Sometimes I wonder about myself and my crazy plans. Anyway, if you follow me on Instagram, you'll see I cast it on about a week and a bit ago and I've been dragging it all over New Zealand with me as we've spent time with family and friends. 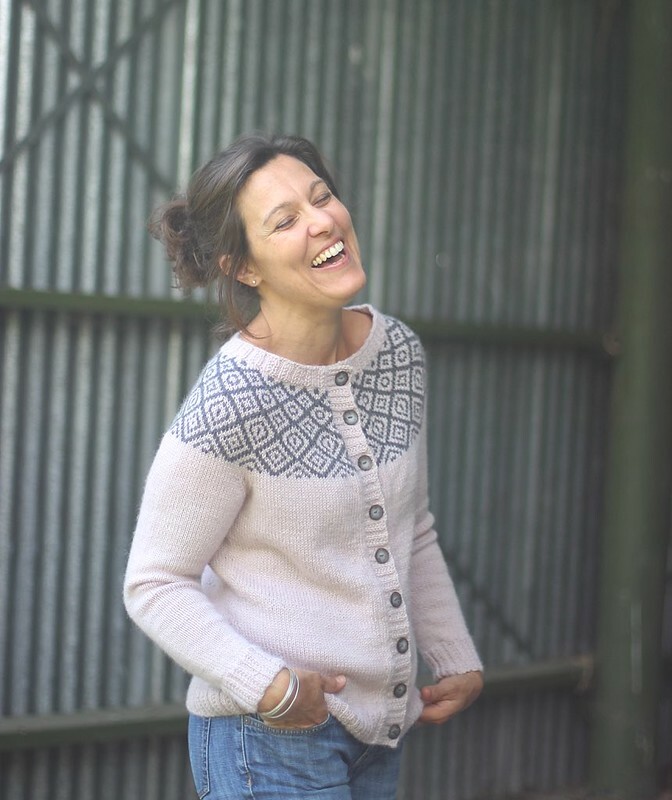 I'm knitting Epistrophy, a Kate Davies pattern from her beautiful new book Yokes. 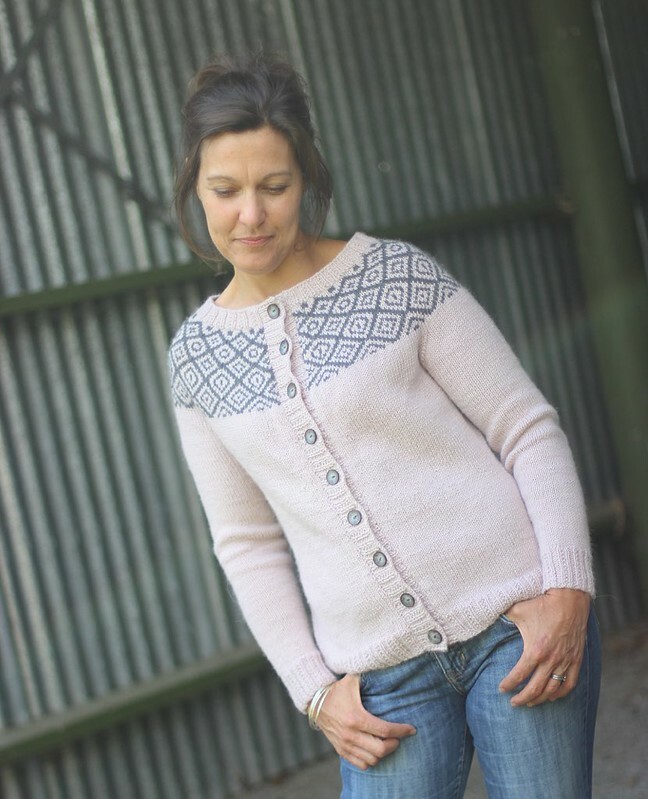 I've bought the book and it was the first cardigan in the collection that caught my eye; a DK weight bottom up cardigan, knitted in the round, sleeves joined at the bottom of the armholes and some simple colourwork around the yoke. Once I get to the top I'll be slicing it down the middle to turn it into a cardigan. I haven't tried steeking before and although once upon a time I was terrified of the prospect of taking scissors to my knitting, now I'm feeling rather excited to try it! The yarn I'm using it absolutely gorgeous. I am totally in love and you'll be seeing more of this yarn from me I'm sure. 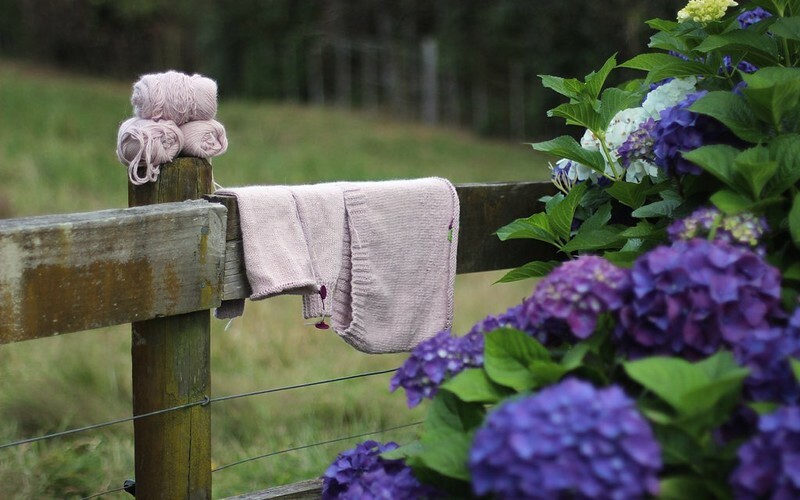 It's Vanitas DK from Outlaw Yarn; a blend of 90% Alpaca & 10% Merino in the "Bone" colourway which is a soft, creamy colour with definite rose pink undertones. I'm teaming it with a delicious, almost liquorice toned grey ("Ebony") for the colour work at the yoke. I am so impressed with how soft this yarn is. The alpaca gives it a lovely halo and it's also beautifully plump. It's a hand-wash only yarn and gives me the impression that it might pill over time, although so far my knitting isn't showing any signs of pilling at all. Vanitas comes all balled up and ready to go in nice hefty 100g skeins which is much more preferable to dragging around a gazillion 50g balls and it's just lovely to knit with. Despite all the festivities and parties, I have been knitting pretty fast when I can and in fact I should be further along than I am. Rather frustratingly I discovered (when I thought I was finished with the body) that I was four stitches short ... Then, I simply could not find those stitches. I hunted and hunted and counted and double checked the maths in the pattern and was totally stumped. In desperation I put the body down and started my sleeves thinking it was more than likely a screamingly obvious mistake and I'd come back to it later when I wasn't surrounded by holiday antics. It was a pretty obvious mistake and I realised it while I was knitting the first sleeve. 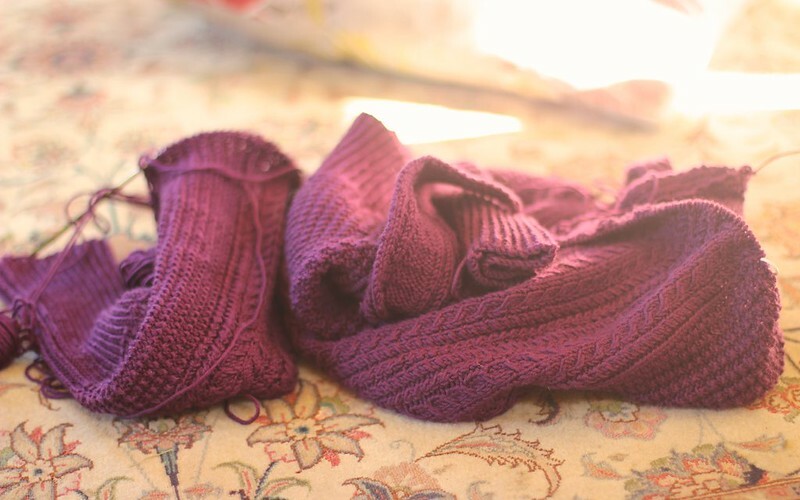 The first set of decreases for both the body and sleeve happen immediately upon moving on from the ribbing. I'd forgotten that and instead of counting my decreases from there, I'd been counting from the next decrease, five rows up. Bingo - there was my mistake. Four too many decreases. It did cross my mind that I could just leave it, pop in another row of increases at the top and call it quits but I couldn't. The extra decreases meant that the waist would not only be nipped in further but also higher. Keeping them would probably create a funny, not quite right look about the shaping and I didn't fancy that. So I ripped back. Inches and inches. Now both sleeves are done and I've raced back up the body and am only a few rows from the top again. But, look at my tensioning?! It's gone all squoo-wiff and loose. Totally yuck.